Although I decided to self-publish DECEPTION back in 2016, I’m happy to see that even after three years my readers are still loving it! A short and sweet review from Georgie. Chuffed to see that she enjoyed the ride! “Through the stark and leafless trees, I see her. I remember the first day I saw her; an instant attraction. I think she’s beautiful. She has such pensive blue eyes; they remind me of a blue sky right before the sun descends. Every time I see her I want to talk to her, I want to get to know her, and I want to be her friend. She usually completes the lower woodland walk in six minutes and forty-two seconds; she misses the deeper woodlands and goes home, I believe. I walk down the road at the same speed as her. She reaches the crossroads at the bottom of the road, looks both ways, and then jogs across into the garden of a house. I stop walking and concentrate on which house is hers. 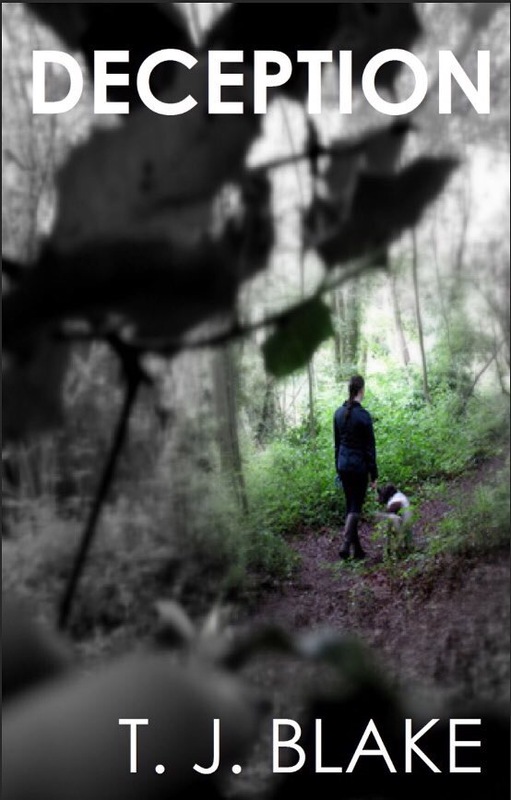 A psychological thriller that will not let you look at passing dog walkers the same. If you would like to read this novel, you can download it here from Amazon. Click the link and it will take you to the right Amazon (UK, US etc.) for you. If you do decide to read DECEPTION then please let me know what you think! You may remember that a few months ago I announced that my 2016 novel, DECEPTION, was getting a new book cover. Although I released and revealed the change, I never actually got a copy of the new cover for myself. Yesterday, my new DECEPTION copy arrived. It’s interesting to see the change of the cover since its revamp too. Original cover (left). New cover (right). The original cover was artsy and although I loved it at the time, the quality of it wasn’t good enough. The coloured focus eye line effect was a nice touch (albeit slightly cheesy) around Eve and her dog Ella, but the cover overall needed to reflect the dark and mysteriousness of the story. The crisp, cleaner cover is much darker, but then the story is quite dark, so it fits with the narrative. The typography is neater too, especially with the inclusion of ‘A Love of Lies‘ on the front and spine. I love the fade effect on ‘Blake‘ on the front cover. It’s a minor touch but I think it adds to the mystery of the novel. 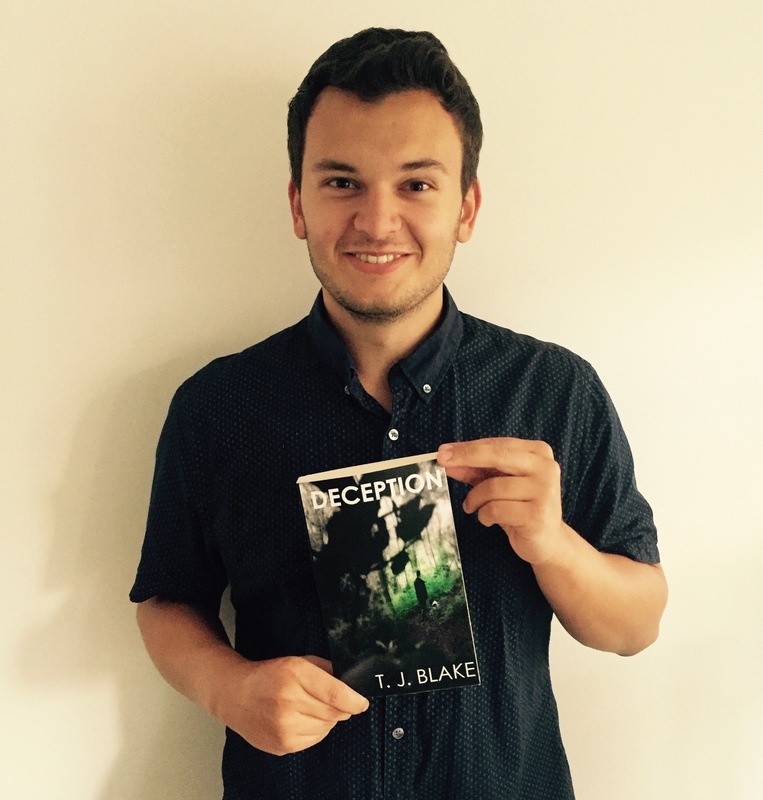 Fancy reading my psychological thriller novel, DECEPTION? Every author wants to read an in-depth review about their book! If you ask an author what they want to achieve in their writing career, especially a self-published author like me, they might say “to be published and have my book adapted into a TV series or movie“. I would be lying if I denied that this is my long term objective… but we also quite like the idea of entertaining readers and hopefully receive positive feedback on our work. Weirdly, this is kind of my review of a review… Book review inception! I’m pleased to say that my novel “DECEPTION: A Love of Lies” has received a fantastic review from a reader. It’s not just any review, it’s a thorough analysis. The reader has taken the time to delve deep into studying the plot, setting and characterisation of ‘DECEPTION‘. It was written to be a suspenseful psychological thriller riddled with clues and dark turns. So I’m very proud to see that this was well received by this reviewer and that they enjoyed the ‘DECEPTION’ experience! Thank you so much for the review Damien if you’re reading this! DECEPTION: A Love of Lies has a new cover! I’m pleased to reveal to all of you the new front cover for DECEPTION. The original cover was good, I still like it, but it became a little outdated and the quality wasn’t the best. I liked its artistic style – it was a black and white cover with an in colour eye line of Billy watching Eve from the bushes. We kept to this theme in the new cover, but modernised it. So here we go, check out the new front cover for DECEPTION (available on Amazon & other bookstores) below! It isn’t, the image is crisp, the cover’s in colour, there’s still a line of sight from Billy’s perspective of Eve walking Ella, and the typography looks waaayyyy better. The slight fade of the ‘KE’ of Blake is a new feature, along with the addition of ‘A Love of Lies’, which all looks pretty awesome. Get in touch, would love to know your thoughts! If you’re interested in finding more about the book, check it out on Amazon. 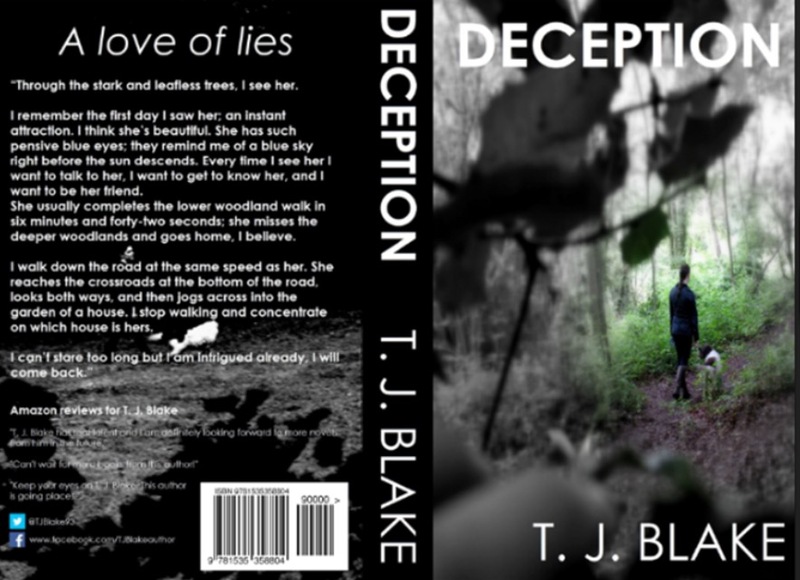 It’s available on eBook: http://getbook.at/DeceptionTJBlake (the link will take you to Amazon, promise. It’s a geo locater to take you to the right site). 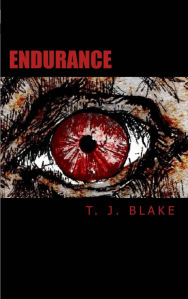 My writing journey began with my debut release, Endurance (2013), a gory dystopian horror-thriller novel. After my fast paced debut came my suspenseful mystery thriller, The Author (2014), which was closely followed by the second gory book of The Endurance Series, Endurance: Apocalypse (2014). I then took a year gap whilst I finished my last year at university. But as soon as I fnished, I was back and I decided to release a tense dark fantasy short story, Alive (2016). After Alive, I released my latest novel, Deception: A Love of Lies (2016) – this book has received wonderful reviews from readers across the globe! I’m always working on new book ideas, my latest includes a brand new horror! My next book to be released is the last instalment of The Endurance Series – which is currently due for release later this year. To find out more about my books and what’s to come, take a look at Books by T. J. Blake. Deception: A Love of Lies Reviewed! Sorry it’s been a while again folks, I’ve had quite a busy New Year so far with life and work – but I’m very happy to see Deception continuing to entertain people. When people read Deception, one key element particularly stands out to them: Characterisation. It’s a theme in this book that is the key to Deception‘s appeal. With an intriguing main character (Billy Allen) and a beautiful, peaceful setting of Lavingsham, this unique story allows us to become part of Billy’s life. The paragraph below taken from my reader’s review sums up the book, and will ultimately tell you if my psychological thriller is a book for you. New 5 🌟 review for Deception from a reader in Canada! Deception has been enjoyed by many readers, mainly in the U.K. and USA, but Deception: A Love of Lies has recently received another 5 star review from a Canadian reader. The review does contain spoilers, so I will not be revealing the full review on my blog, but I will tell you some of the main points from the review. This reader said that Deception was a thrilling story with a surprise ending. They also said ‘the book had me in it’s grip within the first two chapters‘. Read Deception: A Love of Lies now! The 5 star reviews keep on coming. Proud to say that Deception: A Love of Lies has not disappointed – another reader, another 5 star review. You may see that Deception has all these great reviews but wonder if you would like the book. I can tell you, if you’re someone who enjoys a detailed, realistic, intricate and personal read, then you will enjoy my new psychological thriller. Many book reviews can give certain stories away, but the latest reviews do not; and I’m very thankful. The latest review is a good one, the reader has understood the story, they’ve accepted it and they’ve most importantly lived with the main character, Billy, throughout the read. If you allow yourself to join Billy, you will enjoy Deception and you’ll most importantly enjoy the ride into Billy’s life in his little bungalow on Lavingsham Close. YOU can start reading Deception: A Love of Lies right now – download it from Amazon.com or .co.uk today onto your Kindle or eReader. Two more 5 star reviews for Deception! It’s been a while since I last posted, life has been getting in the way of my writing recently, but I have made sure that I have been online and browsing through the online writing community. Which leads me onto the reason for this post – my latest psychological thriller, Deception: A Love of Lies, has received not one, but two amazing 5 star reviews! As one of the two reviews warn, you should be careful reading the reviews for Deception as they may contain spoilers – so I’ll be careful what I post from now on! “I love this book! I am a fan of thrillers and mysteries, (horror too). My favorites are the ones that lead you down the psychological pathway. This author knows how to mess with you. I had a hard time figuring out who was doing what and why. That kept me turning pages until 3 in the morning. The book has two main characters, Billy and Eve, with a few minor characters. They were very well written. I really want to talk more about them but am so afraid of giving away more information than you need. In all honesty, if my review is the first one you are reading than, I would advise you to not read others. Not because I think mine is all you need but because this book is one that you want to go into with the least amount of information. I would suggest you go by synopsis and star rating. Then enjoy all the reviews after you read the book. After you read it, if you want to discuss it send me a message on Goodreads. I would love to talk about it. You have no idea how much I want to say here but won’t ruin it for anyone reading this. Why don’t you read it for yourself? Start reading Deception within minutes by downloading it on Kindle/eBook! Deception: A Love of Lies – What are readers saying about it? For many of us finding a new book to read is tough, but most importantly, finding a book that we can honestly enjoy and become a part of is the biggest challenge. I’m not saying that my latest novel Deception: A Love of Lies is the perfect book for you – I don’t know you and I don’t know your preferred genre of book. But I do know that if you’re someone who appreciates a psychological thriller which has a great deal of mystery, intricate character & setting, and a suspenseful approach to story telling, then Deception is for you. Don’t just take my word for it, my readers have each read and enjoyed my book, but most importantly, they’ve understood it. Check out these quotes below from authentic reviews from readers who have read Deception – these reviews can be found on Amazon and Goodreads. “I don’t often read an entire novel in one sitting, but this one kept me turning pages until 2 a.m. 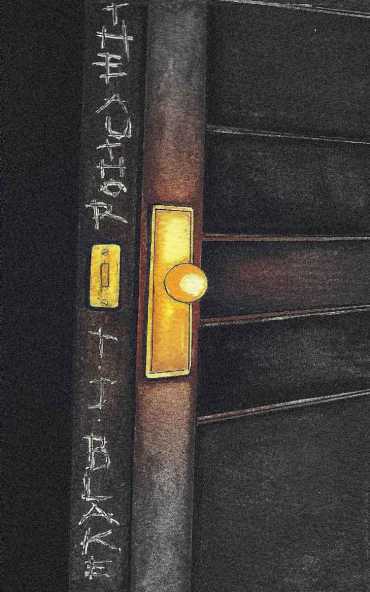 The story begins with an excruciatingly detailed description of walking in the words. Extremely, minutely, detailed and I thought, ok, get on with the story already! Start reading Deception: A Love of Lies now on eBook and Kindle!